A friend of mine commented that Mar Roxas and his party’s insistence that he won as the country’s vice-president in the first national automated elections despite the result consistently saying otherwise cheapens him. According to him, Mar should be gentleman enough to admit defeat and to concede for the nation’s peace and stability. Manny Villar earned a hundred pogi points when he conceded immediately and appeared on tv as a sport despite the billions he lost as expenses in promoting his bid for the presidency. It must be really hard for Mar Roxas to take this loss. He was unbeatable as the vice-presidential candidate at the beginning of the campaign. If ever he thought of losing, for sure he was not thinking of losing against Mayor Jejomar Binay but against Senator Loren Legarda. With all the the publicity stunts he executed, from cursing GMA in public to proposing marriage to Korina in Wowowie, looing might have been really hard to consider. Those TV appearances had gotten him more media mileage compared with his opponents, or so he thought. But things do happen for the worst. And the worst for Mar Roxas happened through his defeat against the underestimated Makati Mayor Jejomar Binay. But surely, defeat does not happen to Mar Roxas alone. And if other defeated persons feel down because of their defeat, so must Mar Roxas. Every person who dreams and fails to accomplish that dream feels debilitated as a natural consequence of things. It does not matter which station in life you are in and what kind of dream you have. You think you will never ever accomplish anything worth accomplishing in life again unless you accomplish that ultimate dream of yours. I have my own share of this defeat when I failed my first bar in 2006. I had a very high opinion of myself and was sure to pass just like Mar Roxas was sure to win in the last vice-presidential race. It would take a miracle for me to fail. And the miracle happened. I failed. The days following the release of the list where my name was not included, I did not want to wake up. And when I had woken up, I did not want to leave the room. I questioned the sun for shining in the morning and the clock for continuously ticking. The world should have stopped when it was known that I failed. I felt like I was a ghost walking the house and the streets. And I wanted to be a ghost so that I can exist without any one’s notice. I felt I no longer deserved membership in my family and my community. I knew I was no longer to become a respected lawyer because even if I make it on second try, I would still carry the stigma of a flunker that would cheapen my stature even as I have not yet begun my career. I was desperate. The irony was, although I wanted to be invisible, I still wanted to be acknowledged. When in the past I felt invincible and independent, I suddenly felt naked and needed the protection and good opinion of peers and relatives. I realized that bar passers need no calls of congratulations because they don’t need it. It should be the bar flunkers who should be consoled although I knew no word can console or substitute for the loss either. It was the lowest point of my life : I experienced the helplessness, hopelessness, and desperation of a bigo. It is a feeling that you are in a dark and lonely place deep below where no human can reach you. 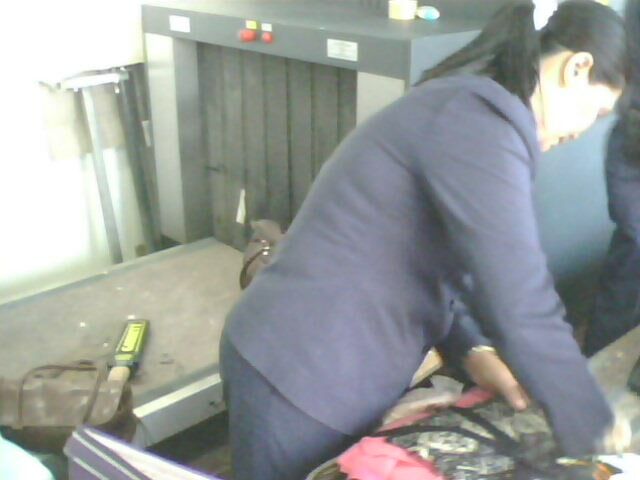 Lady Airport Personnel manually inspects the passenger's baggage in Roxas City Airport. Behind her is the non-working x-ray machine. Picture was taken in April 2010.
office mate Philip. I kissed the carpet with both hands on the floor like a Muslim in prayer would do, and I tried to raise the roof. I sat in fetal position in my revolving chair in the office, and from that time on, I didn’t care about the stigma anymore. All I knew, I have arrived. My boss and my office mate watched me and I knew they were very happy for me too. Senator Mar Roxas loss will also bring him to that dark and lonely place deep below where no man can reach him. There, he will purge himself and come back a new man. He will purge himself for example of the lie that he is from Roxas City when in fact he is from Cubao, Quezon City. This lie propelled him to a seat in the House of Representative as the Congressman for the first district of Capiz for three consecutive terms. Then he became a Senator, and then a cabinet secretary. As a Senator, he claims, among others, that he crafted the cheaper medicines law which benefited the poor, while a congressman from Iloilo says otherwise. He also claims he was responsible for the call center industry in the country while another defeated senatorial candidate claims the same glory. But as our representative from Capiz, and as our Senator, I do not know what he can claim he has done for our province. His wedding feature aired in his wife’s program did not even mention Capiz. I am from Pilar, Capiz, an hour’s ride from Roxas City yet I have never seen significant improvements of that City, of my town and the towns I must pass through to get to my hometown. 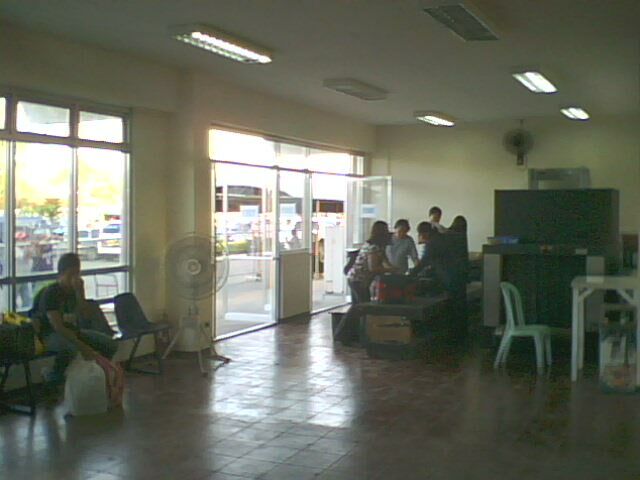 Roxas City airport does not even have a working x-ray machine; passengers have to open baggage for manual checking. Rumors fly that he controls Roxas City. All the big businesses there are either owned or controlled by his family, friends, and relatives. His political enemies cannot put up businesses in Roxas City. I am very sad that I could not and did not support Mar Roxas, and even after his defeat, I still can’t stop campaigning against him. Painting a compassionate image that relates with the masses, as shown in his advertisements, is obviously not enough. He must translate this image into concrete projects that benefit the poor which comprise if not the majority of the people of the place he claims he comes from, the majority of the population of this country. He has lost only in the elections, but I am sure he has not lost the influence that he has especially with our local leaders. Most of the politician in Capiz owe him and his family money. They lend millions of pesos to politicians to finance their bid for a local position with their property as security. He can use this influence as leverage. If only Mar Roxas could give me a reason to support him, I would be as loyal as he is to Noynoy, and as loyal as Noynoy is loyal to him. I suggest he back out from filing his election protest. Pursuing this case will only make his lawyers richer. As to his image, he makes it cheaper. Other comments about this post may be found here. This entry was tagged flunking the bar, makati mayor jejomar binay, Mar Roxas. Bookmark the permalink. Mar Roxas is a typical illustrado..He do not and will never promote the peoples welfare, since he runs his political career as if he is running a business..
Mar’s real personality is the complete opposite of his Mr. Palengke image. His failure in the recently concluded vice-presidential election reminds me of the race between the faster but arrogant and bigheaded rabbit and the slower but persistent turtle..
As long as these tradpols (including Mar) continue to dominate and control Capiz/Pilar politics, our vision of having a progressive town (Pilar) will always be a dream. Im tired of being a dreamer!